Jesse Lizotte entered a photography competition when he was nine, submitting shots of strangers faces. Nine year olds don’t have long legs, so they all appeared low-angled and presumably, a curious melange of drama and naïveté. Jesse didn’t win. Still takes photos though. Now, in the tail end of his twenties, he lives between L.A., New York and Sydney and has shot faces like Winnie Harlow, Kozue Akimoto and Catherine McNeil. We spoke with him about his intercontinental upbringing, affinity for Japan and the time he nearly died. Catherine McNeil from "No Love Lost"
What has your life looked like these past few months? Long haul flights, airport customs and living out of a suitcase! I’ve been lucky to have grown up between New York and Sydney. It gave me an appreciation for the lifestyle and luxuries we have here in Australia, as well as a different perspective on American culture and a thirst for travel and adventure. I think the tyranny of distance can be a great thing for creativity! "the tyranny of distance can be a great thing for creativity"
How about your heritage—has that helped inform your work? My Mum is Thai and she grew up in Canberra (Australia) so, to be honest, I can't say it’s had a big impact on me. She always instilled in us Thai values like respect and Buddhist ideology but I don't speak Thai which is one of my biggest regrets! As a kid coming from New York, I would visit my grandma in Bangkok and just thought it was so wild and uncouth. There were chickens running around in the backyard, broken glass bottles on the tops of the walls to deter chiefs, (Asian grandma thing—always convinced someone is out to steal her gold) [laughs] rabid dogs roaming around and we showered with a bucket and a cup! You shot a series called Born Too Late in 2015 which focused on the Yakuza. More recently you unearthed a rockabilly dance club in Yoyogi Park and shot them. What’s so captivating about Japan? In such a fast paced technological society there are still these elements from the past they [the Japanese] cling to. Which is in some ways beautiful but it can also be detrimental to progress—for instance their attitudes towards women in the workplace and the repression of sexuality. I grew up watching Yakuza movies and looking at photos by Seiji Kurata of Tokyo's underworld and became obsessed with them. I bought a ticket to Japan as soon as I could, when I was 19 years old, and a love affair ensued [laughs]. I felt it was important to document these people on the fringes of society because Japan was changing at such a rapid pace, I might never get the chance again. You shoot models, regular people, landscapes and more. What’s the difference? I approach each subject in the same way—although I'm most interested in the story behind a person. When I started taking photos of my friends as a teenager it was to tell our story; I thought one day we’d want to remember the chaos. Then I gravitated towards subcultures outside of skating, documenting my travels in Japan and the USA. I would cold stop people on the street, someone who had maybe never been photographed before and that was really intimidating for me. So when I was asked to shoot a fashion story with a model I thought that was a walk in the park! "I thought one day we’d want to remember the chaos"
As early as 9 years old—I was part of an after school photography club in New York. I entered my first photo competition then, and I remember being so happy just to receive a certificate of participation from Boy Scouts of America. I was short then and all the photos were shot from what appears to be a very low angle, looking up at a window in a building or the bottom of some stranger’s face! That was my introduction to street photography. A photo that someone else took that you wish you took? 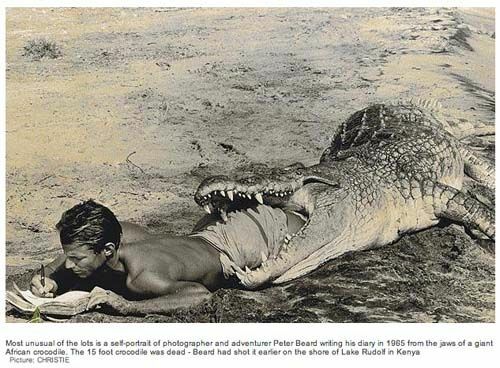 I love this photo by Peter Beard where he’s inside a crocodiles mouth writing in his diary! That’s pretty gnarly. The weirdest thing that’s ever happened while taking pictures? One instance where I was hanging out of a car window flying down a freeway at night. I had my assistant hold my legs so I wouldn’t fly away. I was caught up in the moment, snapping away and I pulled my head in briefly to show her a photo on the back of the camera like “wooooo check this out!” and at that moment a pole whizzed past and narrowly missed my head by a few hairs. That sent a chill down my spine—I really should have been dead; gruesome Final Destination style!